Supersonic airliners are poised for a comeback. But while we await the arrival of a new generation of commercial jets that break the sound barrier, Boeing is working on another way to speed up air travel: toeing right up to the speed of sound. The aviation giant is building an ultra-lightweight folding “transonic” wing, which Boeing says will allow larger planes to fly at higher altitudes while nearly scraping the speed of sound. The ultimate goal is to make long-haul flights seem more like medium-haul flights as the wings propel aircraft at speeds just below Mach 1. According to recent lab tests conducted by Boeing, the conceptual design would allow aircraft to generate top speeds of Mach 0.8. That pales in comparison to the defunct Concorde jet, which reached a top speed of Mach 2.04, or 1,354 mph, before its 2003 retirement, but Boeing’s transonic speeds would exceed what today’s airliners achieve (typically in the 400- to 600-mph range, for physics reasons). The wings are also “less noisy,” according to the company, which sounds like an added bonus for anyone concerned with loud, clattering engines typical of commercial jets (or the sonic booms of supersonic planes). This technology hits a recurring theme for Boeing, with the company prioritizing bigger and more efficient machinery. Boeing’s 777X jet, for instance, is destined to be the largest twin-engine airliner in the world when it hits the market later this year. 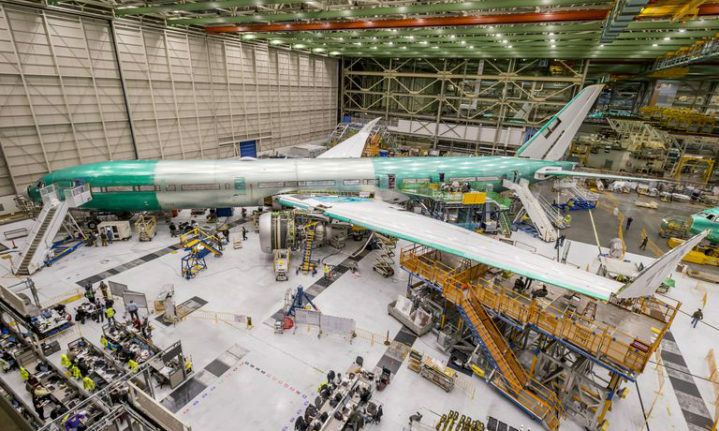 The 777X will also boast the longest range of any commercial jet, which is currently a 19-hour, 11,162-mile slog from New York City to Singapore. Boeing has other projects on the horizon, and they are similarly big and fast. The company’s 777X jet was recently paired with General Electric’s hulking GE9X engine for the first time. Encased in a burly 14-1/2-foot engine capsule, and with 16 blades crammed into a composite fan stretching 11 feet in diameter, the GE9X will be the biggest turbine engine in the world when the 777X takes to the skies later this year.